BEN LUKAS BOYSEN AND SEBASTIAN PLANO-EVERYTHING. Nowadays, not every musician dreams of embarking upon a career as a rock star, and leading a life where many people think that excess and debauchery are the norm. That used to be the case during the golden age of rock, when bands survived tours on a daily diet of drink and drugs, and regularly wrecked their hotel rooms rather than sleeping in them. Night after night, chaos ensued and the motto was what happens on tour stays on tour. Usually that was the case. However, that all changed with arrival of mobile phones, social media, the internet and computers. Since their arrival it’s made it impossible for musicians to behave in the way that they used to. Nowadays, their every move can be captured on camera phones, and documented and commented upon on social media by the gossip hungry little people. They live prurient, empty lives and sit in judgment at the merest misdemeanour made by ageing and errant rock stars. Strangely, the latest generation of musicians don’t seem to be making the same mistakes as their predecessors. They behave and in a very different way, and don’t seem to indulge in the same hijinks as the musicians from the sixties and seventies. Musicians today also take a different approach to music, and even make music in a different way. It used to be that most musicians either played guitars, drums, keyboards and bass. Nowadays, some musicians don’t play any of the traditional instruments, and instead, make music with synths, sequencers, samplers and drum machines. They record their music in home studios using digital audio interfaces onto digital audio workstations on laptops. It’s a far cry from the golden age of rock. What has also changed is the type music that the new generation of musicians are making. It used to be artists released solo albums, or occasionally, collaborated on album. They were released by major labels and were often extremely lucrative. Sadly, not any more. No longer are albums the cash cow they once were. As a result, many modern musicians are happy to eschew a career as a potential rock ’n’ roll star, and instead, compose music for commercials, soundtracks and video games. This includes Ben Lukas Boysen and Sebastian Plano who were commissioned to provide the four-hour score to David O’Reilly’s interactive video game Everything. Their intricate and ethereal score was designed to add an atmospheric backdrop to Everything which is narrated by philosopher Alan Watts. This was the perfect backdrop to Everything, and was a far cry from the soundtrack that accompanied early video games. They used to feature a myriad of lo-fi beeps and squeaks. However, games soundtracks have come a long way since then, Proof of that is Ben Lukas Boysen and Sebastian Plano score to Everything. When Erased Tapes Records’ founder Robert Raths heard the score to Everything, he realised that it had the potential to work as a standalone album. There was only one problem, the score lasted just over three hours. This meant that Robert Raths had to whittle down the three hours score so that it would fit on one CD or LP. Eventually, he settled on ten tracks that featured a tantalising taste of the Everything score. As an added bonus, each CD or LP should include a download code for the forty-three track score which will allow the listener to hear Everything in all its splendour. It shows how far video game scores have come since the days of Pacman, Space Invaders and Tetris. Back then, only the most optimistic person would’ve thought that one day, the score to a video game would be marketed as a standalone album. How times have changed. However, back in the early days of video games, designers didn’t place the same importance on music. It was almost an afterthought, with only a fraction of the budget allotted to the soundtrack. Nowadays, things are very different. When it came for games designer David O’Reilly to commission composers to produce the score for Everything, he turned to German composers Ben Lukas Boysen and Sebastian Plano. They were tasked with producing a sprawling four-hour, immersive soundtrack. This would provide the backdrop to a game about perspective and the interconnectivity of all life. It’s essentially a philosophical simulation game. What many gamers will find strange about Everything is that there’s no real objective to the game, which is the point of the game. However while gamers while away the hours whilst playing this philosophical simulation game, they’re are exposed to the ambient and elegiac delights of Ben Lukas Boysen and Sebastian Plano’s score. Both Ben Lukas Boysen and Sebastian Plano have vast experience in creating stirring ambient soundscapes and evocative themes using a variety of acoustic and electronic sources. These are their musical palette, which they’ve put to good use over the years. That is the case on Everything, which showcases lush, ambient soundscapes where the music is ethereal, elegiac, rich in texture and cinematic. Ben Lukas Boysen and Sebastian Plano’s music sets both the gamer and the listener’s imagination racing, as they embark on journey. In the case of the gamer, it’s through David O’Reilly’s interactive video game Everything. However, even those who have never played a video game in their life will be enchanted and captivated by the music on Everything. It marries elements of ambient music with abstract, avant-garde, electronica, experimental, the Berlin School of Electronic music and modern classical music. The result is ten tracks lasting thirty-nine minutes that leave the listener in a meditative state. This is quite remarkable given the music on Everything was initially the soundtrack to a video game. Everything is also a journey that many gamers and music fans will enjoy, embrace and appreciate. In the case of games, they’ll enjoying whiling away the long winter hours playing David O’Reilly’s interactive philosophical simulation game. As they ponder the meaning of life, Ben Lukas Boysen and Sebastian Plano will provide the backdrop for their musing. Meanwhile, non-gamers are able to enjoy and immerse themselves in the delight Everything which also works just as well as a standalone album. That shows how far video games have come. The best way to experience the music on Everything is to familiarise oneself first with the music on the CD or LP. These ten tracks are a tantalising taste of the ambient delights of Everything, It’s an immersive album of beautiful, elegiac, ethereal, emotive, evocative and stirring multilayered lush music. Other times, the music is thoughtful and ruminative inviting reflection. Meanwhile, the music meanders majestically along, taking twists and turns, gradually revealing its sonic secrets. Everything is full of sonic secrets, which are the result of a sonic sleight of hand. They transform the original sound into something very different, that plays its part in what’s essentially a carefully woven musical tapestry. 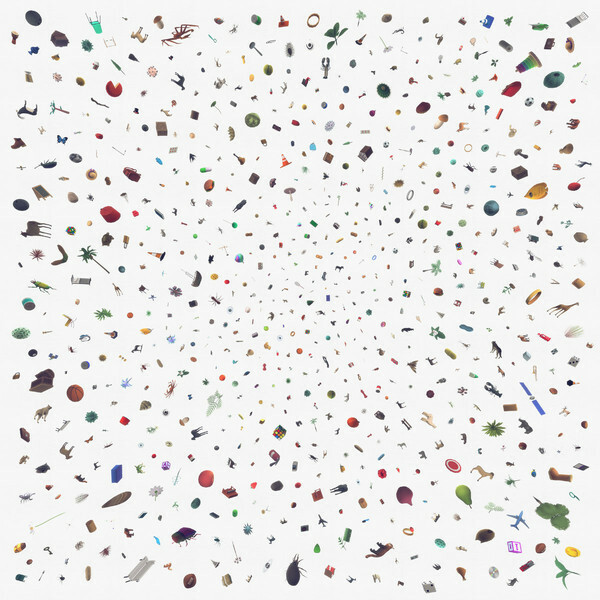 There’s a total of forty-three parts to Ben Lukas Boysen and Sebastian Plano’s musical tapestry. Having familiarised oneself with the ten tracks on Everything, the time comes to enter the download card that accompanies the CD or LP. Soon, the forty-three tracks that feature on soundtrack to Everything are sitting on the hard drive of one’s laptop. Now this musical feast can begin. The musical feast that is Everything lasts for three hours, nine minutes and fifteen-seconds. It’s a captivating and immersive musical experience that sets the imagination racing as Everything reveals its many secrets and subtleties. Just like the ten tracks on the CD version of Everything, the multilayered music is variously beautiful, elegiac, ethereal, evocative and stirring and lush. Other times, the music is thoughtful and ruminative, and invites reflection. This is fitting given Everything is a philosophical simulation game. Meanwhile, the music meanders along, taking twists and turns, gradually revealing a myriad of sonic secrets. Sometimes, the music is dramatic, while other times it becomes haunting, understated and minimalist, before becoming slow and spacious and even moody and broody. Occasionally, the music on Everything becomes otherworldly, lysergic, futuristic, experimental and abstract. Other times, the music becomes rueful, wistful and melancholy, before becoming uplifting, spirited and stirring. There’s even a spiritual quality on It Keeps Going, before Everything gradually builds towards a crescendo on the last three soundscapes. This starts with the moderne sounding Here and There which manages to cascade and meanders simultaneously, while marrying elements of electronica and classical. This gives way to Under and Over, before the celebratory, joyous and uplifting describes You’re Everything which brings Everything to a close after forty-three soundscapes. Throughout Everything, the soundscapes are rich in imagery and have a cinematic quality. This sets the listener’s imagination racing as the music paint’s pictures in the mind’s eye. That is the case for just over three hours, where the music ebbs and flows, and takes many a twist and turn. There’s surprises aplenty awaiting the listener, who are sure to embrace, enjoy and appreciate this ambitious and carefully crafted soundtrack album, Everything. It’s the work of two musical master craftsmen, Ben Lukas Boysen and Sebastian Plano, who have woven an intricate and intriguing musical tapestry. That tapestry became Everything which was recently released on CD and LP by London-based label Erased Tapes Records. It features ten stirring ambient soundscapes which showcase evocative and emotive themes. These soundscape were created using a variety of acoustic and electronic sources. This was the equivalent to Ben Lukas Boysen and Sebastian Plano’s musical palette, which they’ve put to good on Everything, which started life as the soundtrack to a video game. Later, Everything became a standalone album, that features lush, ambient soundscapes where the music is beautiful, ethereal, elegiac, ruminative, rich in texture and always has a cinematic quality. These ten tracks are a tantalising taste of the musical feast that awaits the listener when they download Everything in its entirety. Everything features forty-three soundscapes and lasts over three hours, and is Ben Lukas Boysen and Sebastian Plano’s ambient Magnus Opus, that shows just how far video game scores have come in the last thirty years. ← MOGWAI-EVERY COUNTRY’S SUN-INDIES ONLY VINYL EDITION.